and at STOWE ARTS, at STOWE SCHOOL. Contact the venues direct for latest course dates and avaiablility. 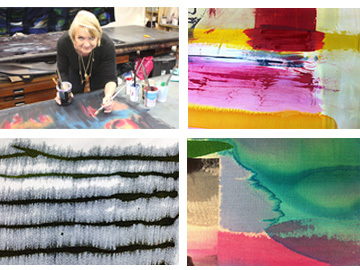 Carole demystifies the use of dyes as a medium for painting and screenprinting onto natural fabrics for art pieces, scarves and clothing, or for interior design projects. She teaches hand-painting techniques and the use of simple stencils as well as photo stencils for textile application. 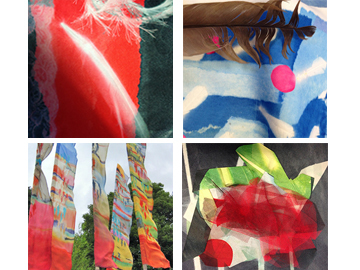 You need no previous experience, just an enthusiasm or textiles, colour and mark making. Glorious colours and instant results using simple techniques which are easily achieved at home and which explore the impregnation of various fabrics with dye and how marks can be very specifically made – or allowed to create themselves. Painting with liquid dyes allows the medium to run through the weave – whilst printing places the colour exactly where it is wanted through a technique called sublimation (heat transfer) This allows you to print flat colour through hand cut stencils, linear or painted images onto man made fabrics. A fantastic way to transform existing clothing and cloth – easily achieved at home with an iron.